SSO is available only in Heroku Enterprise. For specific instructions for other SSO providers, see the Using Single Sign-On Services with Heroku, for Administrators article. Salesforce Identity can serve as the identity provider, or “IdP,” to provide single sign-on (SSO) user login to Heroku via SAML. If you need to setup Salesforce as an identity provider or change the identity provider configuration, refer detailed instructions including prerequisites. In the Heroku web interface, select the Heroku Enterprise Team or Enterprise Account for which you want to set up SSO. Go to the settings tab, click ‘Setup SSO’ and upload the IdP metadata file you downloaded from Salesforce. Toggle 'Enable SSO’ switch to enable federation. You will see three values displayed in the Heroku dashboard in quick-copy fields. You’ll need these values to create and setup a Connected App on Salesforce using the following steps. 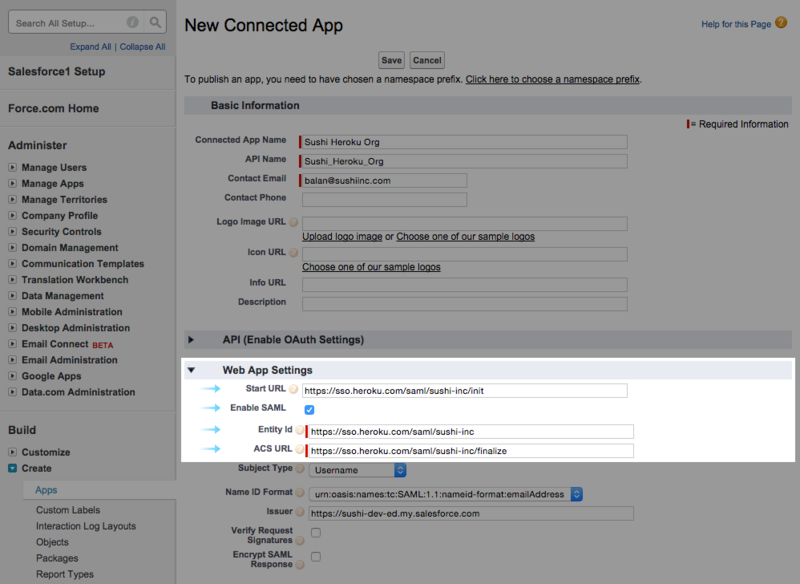 Fill in the required “Connected App Name”, “API Name”, and “Contact E-mail” fields. Note the app name because you’ll need it in the next step. In the “Web App Settings” area, click “Enable SAML” and paste in the three values from the Heroku dashboard. Make sure that the “Name ID Format” pick-list in the Salesforce interface is set to the format described in the Heroku SSO settings list. Finally, you’ll need to grant users access to this “Connected app” to enable SSO. Navigate to your Salesforce Admin homepage. Click Administer > Manage Users > Profiles. Click the “Profile Name” of the user profile to which you want to extend Heroku login. Congratulations! Setup is complete. Heroku users will now be able to login using Salesforce credentials at the “Heroku Login URL” you have configured.